The 1849 Derby attracted stakes of £6,575, the largest in its history. It was held on Wednesday 26th May, in perfect weather, with a field of twenty-six runners. The winner was Archibald Montgomerie, 13th Earl of Eglinton’s brown colt The Flying Dutchman, ridden by Charlie Marlow, which won the St Leger that same year. The Earl, a dashing figure who had owned racehorses since his teens, was famed for the Eglinton Tournament held at his Ayrshire estate in 1839. Attended by the flower of the aristocracy, this jousting tournament aimed to replicate the Age of Chivalry, but fell victim to Scottish summer downpours. The Flying Dutchman, by Bay Middleton out of Barbelle, was trained by John Fobert at Middleham. His biggest rival was Colonel Peel’s Tadmor, which was 2 to 1 joint favourite for the Derby with ‘The Dutchman’. Sir Joseph Hawley’s Vatican led from the start and was challenged after Tattenham Corner by The Flying Dutchman, Tadmor and the 50 to 1 outsider Hotspur. Two furlongs out Vatican was a beaten horse and The Flying Dutchman gained a narrow lead from Hotspur and Tadmor. In the drive to the finish it looked as if Hotspur would win, but The Flying Dutchman rallied and came home with half a length to spare, with Tadmor third. 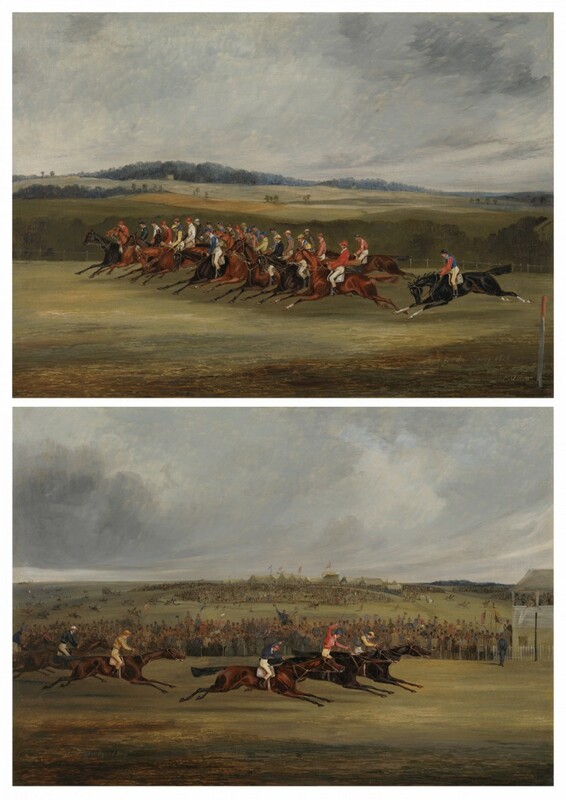 Alken’s painting of The Finish also shows the horses which came fourth and fifth, Lord Clifden’s Honeycomb and Lord Stanley’s Uriel. Eglinton’s colours, yellow on blue, were based on the Montgomerie tartan. Lord Eglinton had a huge win and fellow members of the Army and Navy Club – nicknamed the Ragged Famine Club – cleared over £30,000. The trainer Fobert had an ox killed to feast over a hundred poor families at Middleham in celebration. Alken’s Start depicts the twenty-six runners, the remainder being Sir C Monck’s Vanguard, Mr John Bowes’s The Knout, Lord Bateman’s Goodwood, Mr Farrance’s The Old Fox, Sir C Cockerell’s Thibault, Lord Eglinton’s Elthiron, Mr A Nichol’s Nunnykirk, Lord Exeter’s Glenalvon, Mr Campbell’s Robert de Brus, Mr H Hill’s Henry of Exeter, Mr Walls’s Chatterer, Mr B Green’s Westow, Sir Gilbert Heathcote’s Companion, Mr Burgess’s The Crowner, Mr Pedley’s Old Dan Tucker, Mr Disney’s Montague, Mr Gratwicke’s Landgrave, Mr Jaque’s Chantrey, Mr F Nicholl’s Woolwich and the Duke of Rutland’s Fire-Eater. Henry Alken Snr was the most important member of the Alken family of painters. He was of Danish ancestry, the son of Samuel Alken, and brother of George, Samuel Jnr and Sefferien John. Of Henry Alken’s five children, Samuel Henry, known as Henry Alken Jnr, and Sefferien Jnr were also artists. Henry Alken first studied with his father, and later trained with the miniaturist J T Barber, whose work influenced Alken’s handling of figures. He exhibited two pictures at the Royal Academy in 1801 and 1802, both miniatures. Following his marriage in 1809, Alken began a successful career as a graphic journalist, working under the pseudonym of ‘Ben Tally-Ho’. In 1815 he visited Waterloo; his prints of the battle, as well as his portraits of Wellington, Blucher and the Marquis of Anglesey, were published by S and J Fuller the same year. In 1816, Alken wrote and published The Beauties and Defects in the Figure of a Horse. His other works as an illustrator included The National Sports of Great Britain, 1821, and the more famous Life and Death of John Mytton, 1837. Alken painted hunting, racing and coaching scenes and a miscellany of other sports; many of these pictures were produced in pairs and sets. Stylistically, he influenced both his own family of painters and many later sporting artists.